Brevard College was recently named one of the safest colleges in North Carolina, according to BackgroundChecks.org in its Annual “Safest Colleges in North Carolina” report for 2016. “This is a true achievement, which is a result of college administration, faculty, students and police working together to create a safe atmosphere that fosters a great academic environment,” said BackgroundChecks.org’s Outreach Director, Jason Quimby. Brevard College is a thriving liberal arts college. Brevard’s intentionally small classrooms, commitment to experiential education and outstanding location create a close-knit college experience like no other. All matters involving violations of college regulations and criminal law are vigorously addressed through Campus Judicial Proceedings and, when state, federal, or local laws are involved, with the appropriate law enforcement agency. Campus Judicial Procedures are administered through Campus Life. They are structured and formal so that all parties have an opportunity to present their point of view. All violations are reported annually to the Department of Education pursuit to the requirements of the Clery Act, and statistics are also published on the campus website. In order to ensure safety on campus, one Resident Assistant per residence hall is required to be on campus and perform “rounds” each night. Rounds include walking through the halls of each floor or building to ensure the safety of students and that halls are up to regulation. All residence halls are equipped with fire alarm sensors, which automatically activate audible and strobe light signals. All fire alarm activations are immediately reported to the Brevard Fire Department, which responds to all calls, including even relatively minor issues such as burned popcorn. Visitors who intend to stay on campus are required to fill out a form so that authorities are aware of unknown persons staying in the residence halls. This keeps everyone, including other residents, informed and accountable. Anyone having direct contact with the students, including faculty, staff, coaches, and volunteers go thorough vetting process including, but not limited to, a complete background check, Jacobsen said. To compile the report, BackgroundChecks.org combined data from recent Department of Education Reports, natural language analysis, social media sentiment analysis and its own research to create a ranking of the safest colleges in North Carolina. 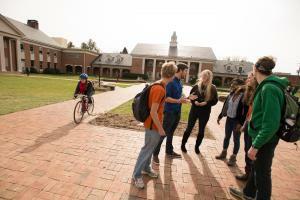 In the report, Brevard College was ranked above neighboring Mars Hill University as it found its place on the list among other larger institutions, such as UNC Chapel Hill and Wake Forest University.